No messy dust. Kills black garden ants & their nests. Active ingredient derived from nature. AntStop!? Granules contain Spinosad, an active ingredient derived from natural soil bacterium. AntStop!? Granules have been designed to be easy to use and can destroy an entire ants nest with one application. 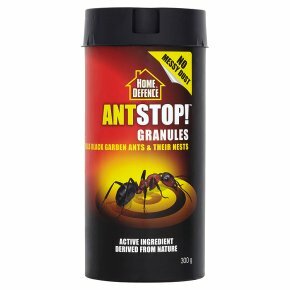 These dust-free granules have been formulated with an irresistible sugar based carrier that actually attracts the ants. This advanced formula is not designed to kill ants instantly, so they take the AntStop!? back to the nest and the entire colony can be destroyed. Effective for up to 1 month. To avoid risks to human health and the environment, comply with the instructions for use.<br>PRECAUTIONS:<br>KEEP OUT OF REACH OF CHILDREN.<br>KEEP IN A SAFE PLACE.<br>KEEP AWAY FROM FOOD, DRINK AND ANIMAL FEEDING STUFFS.<br>WASH HANDS AND EXPOSED SKIN before meals and after use.<br>Harmful to aquatic life with long lasting effects.<br>Avoid release to the environment.<br>Read label before use.<br>Do not eat, drink or smoke when using this product.<br>If medical advice is needed, have product container or label at hand. Dispose of contents/container to a household waste site (civic amenity site).<br>FOR OUT DOOR USE ONLY.<br>DO NOT USE where food, feed or water could become contaminated.<br>PREVENT ACCESS TO BAITS by children and animals.<br>Do not empty into drains.<br>DO NOT USE NEAR DRAINS.<br>PREVENT ANY SURFACE RUN-OFF FROM ENTERING DRAINS.<br>Do not contaminate ground, waterbodies or watercourses with chemicals or used container.<br>Do not reuse container.<br>HAZARDOUS TO BEES.<br>REMOVE ALL REMAINS OF BAIT and bait containers.<br>This material and its container must be disposed of in a safe way.<br>FIRST AID MEASURES:<br>No specific treatment. Treat symptomatically.<br>Contact poison treatment specialist immediately if large quantities have been ingested or inhaled.